Pope Francis I. 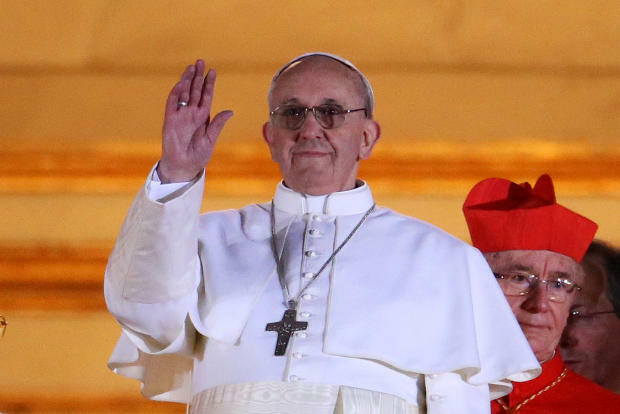 Is the the "Last Pope"? Whitley and I taped this interview the day after Pope Francis has chosen. In the first free interview open to the general public we warm up to the subject of the new pope, and what many of you are dying to find out from me are the prophetic connections he has to the prophecies of St. Malachy as being the final pope. He has significant connection not only to Malachy’s predictions but also to Nostradamus who may have lightly veiled his name when naming him. Check out how you can stream the interview, here. In the second interview for subscribers entitled “Pope Francis and the stars”, we open the Vatican vaults, as it were and examine the dark secrets and conspiracies this new pope will soon face. I highly recommend you listen to part two of this interview by becoming a subscriber to Whitley Strieber’s Unknowncountry. Here’s how you can become a subscriber. Join George Noory and me for a three-hour exploration of Catholic prophecies about the next pope possibly becoming the last pope. Read more about it, here. Whitley and I taped this interview two days after Pope Benedict XVI cited health and age as cause for his resignation. Abdications on account of age are extremely rare as most popes believe they are ordained by God to leave the throne of St. Peter feet first. There is much more going on than mere age. A number of scandals have come home to roost so pervasively that this pope has been pressured to resign. And it was forseen by the greatest of Catholic seers, Medieval Saint Malachy. The next pope will be the last in his list before the Catholic version of the Apocalypse, which describes a crisis of faith of the highest authorities of the Roman Catholic Church. Check out how you can get this free feed and also how you can subscribe to receive part two of our interview, here. I highly recommend you listen to part two of this interview by becoming a subscriber to Whitley Strieber’s Unknowncountry. Here’s more information about the second interview. Under the shadow of war in Gaza, Whitley Strieber and I taped a powerful interview about Nostradamus’ very clear and dated predictions about a future war between America, Israel against Iran. We also looked at clear predictions about Barack Obama being Nostradamus’ foreseen “Black King”. A rare configuration of planets shortly after his inauguration as President in 2009 indicate that if there is a slim chance of a negotiated peace forestalling 20 years of war plans to take down the Iranian regime it is Obama’s destiny to prevent what could be the greatest Middle Eastern war of them all. This war, if it happens will affect every one of you. That is why it is most important that you anticipate and help forestall this oncoming war by listening into our show (click on Dreamland) and also, reading the subject of that show, my new eBook, Nostradamus: The war with Iran. This is a new Canadian series in which I will frequently appear, most likely talking about seers, such as Nostradamus, The Hopi, St. Hildegard of Bingen, Edgar Cayce, St. Malachy and his papal prophecies, etc. Read the full details and schedules by clicking on Prophesy. The Hopi people have warned us that the world is headed for extinction. Based in the Arizona Desert, the Native American tribe of the Hopi has been prophesying about the fate of society for centuries. They have accurately predicted the coming of the settlers to their land, the birth of telecommunication, and the worldwide spread of the internet. The Hopi believe that our actions have caused the earth to become out of balance which will lead to a cataclysmic great purification of the planet that few will survive. To herald these end times, the Hopi believe that a blue star will arise in the heavens, followed by a great shaking of the earth. These prophecies have been passed down from generation to generation and warn of massive earthquakes, tsunamis and super-volcanos that threaten the lives of millions. The Foster family of Illinois is prepping in their own way to be ready for the end. HOGUE SIGHTING POTENTIAL: I filmed a lot of stuff on the Hopi. Could be in this one too. 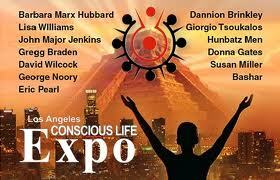 I am giving a workshop at the Conscious Life Expo at Noon until 1:30 Pacific Time, Saturday, 6 October 2012. For more information, Click on Workshop. Later that evening, you can have dinner with me by attending Coast to Coast AM Host George Noory’s special banquet where you can hob nob with me and other CLE guests. The banquet comes out steaming at 6 to 9 pm. For more information about how you can attend, click on Banquet. On Sunday, I will be appearing in the Special Event, George Noory’s panel on Prophecy, Sunday 7 October, from Noon to 2 pm. Click on Prophecy Panel. MIND PLAGUE and its antedote. For more details, see other 2012 related events foreseen, read the following: Predictions for 2012. A rare cameo where I am not censored for explaining my sympathetic skeptical inquiry into Mayan 2012 prophecy. For more information, check out my new book currently in production for release in September 2012: click on 2012. Futurologist Bruce Bueno de Mesquita is profiled as this “next” Nostradamus using mathematics to predict the future, but he has quite large shoes to fill, those of the subjective prophet Nostradamus. De Mesquita can look into the future 18 months. Nostradamus peers thousands of years into the future. This though is perhaps the best documentary I’ve appeared on in the last several years. Go to History.com to check the schedule for reruns and to purchase a DVD of this beautifully filmed documentary. 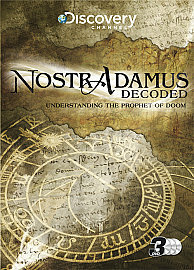 A beautifully produced look at the 2012 prophecies and Nostradamus’ connection. 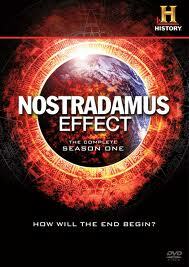 However, because I had nothing positive to say about a Nostradamus connection to 2012, you’ll see me mostly talking about Nostradamus’ prophecies in an indirect way, and the production try to salvage this general rehash of the documentary “The Lost Book of Nostradamus”. I will soon be publishing my “Last Word” on this controversy and setting the record straight on Nostradamus’ connection to the Maya prophecy that has been completely overlooked by the Mayan Book Business and its many 2012er authors. 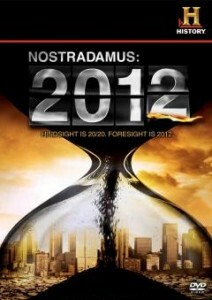 Click on Nostradamus 2012. 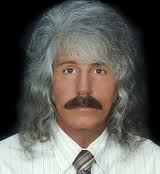 Join me and Jim Harold as we cover a number of topics about human destiny in the second half of 2012. We taped this show last Wednesday. Early in the opening hour, George Noory would like me to comment on a recent poll published that sees 10 percent of the US population believing the end of the world will happen on 21 December 2012, the purported end of the Mayan Calendar 5,000-year era. For more details about the astrology for that day, plus other 2012 related events foreseen, read the following: Predictions for 2012. We do our traditional “radical” New Year’s look at 2012 and the future . 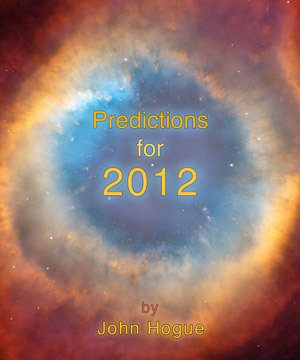 Join us for a three-hour marathon of prophecies for 2012 based on my e-book Predictions for 2012. PAST TV AND RADIO SHOWS….. 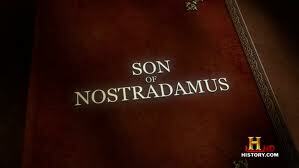 This episode was inspired by my sympathetic skeptical inquiry into who wrote the so-called Lost Book of Nostradamus. It wasn’t Nostradamus. It could have been his son. Watch the show and find out. It’s our New Years show with a new e-book out. See what we’ll be talking about for 90 minutes: Predictions for 2012. Futurologist Bruce Bueno de Mesquita is profiled as this “next” Nostradamus using mathematics to predict the future, but he has quite large shoes to fill, those of the subjective prophet Nostradamus. De Mesquita can look into the future 18 months. Nostradamus peers thousands of years into the future. This though is perhaps the best documentary I’ve appeared on in the last several years..
We taped a second interview for Dreamland subscribers. We delve deep into the astrology aspects as they influence world politics and history for the coming six months. Then, there is an additional surprise segment on Comet Elenin and its potential ability to influence natural and political disasters on Earth this September and November. This interview is for Dreamland subscribers only. But it is well worth subscribing for a month to listen to it for the low price of $3.95. Subscribe Here. I appear extensively in this Discovery Channel rerun. It is one of the best documentaries of the last decade, though, as is Discovery Channel’s bias, they do tend to be one-sided skeptical in the second hour at times, getting away with saying things that I could have easily challenged, but was not given chance to challenge. One of these days, I hope to convince Discovery to give the sympathetic skeptics like myself the chance to retort sloppy and lazy skeptical inquiry. This is a beautifully produced if somewhat content flawed two-hour study on the Mayan Calendar and how it relates, if at all, to the prophecies of Nostradamus and other prophetic traditions. Although they cut my skeptical take on the Lost Book of Nostradamus alluding to the Mayan Calendar purportedly ending in 2012, it is well worth watching for all the things they “did” allow me to say in the final cut, because they are far more immediate and significant to your near future. –Listen to archived show by clicking on this Coast to Coast link. The Coast webmaster will refresh their homepage shortly, so if you don’t see me posted there, not to worry. I’m definitely on Wednesday night for two hours. 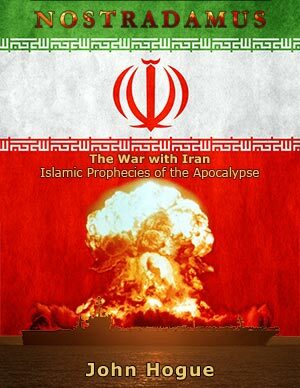 THEME: Nostradamus’ Mabus, Third Antichrist prophecies and how they related to the death of Usama Bin Laden. See Mabus and also: Predictions for 2011. Tons of things to talk about: Gaddafi, Libyan civil war, regional Arab revolutions, the oncoming Day of Rage demonstrations this Friday in Palestinian lands. There’s the weather, and food crop failures setting up the world for a food crisis. There’s the coming riot inside the US Capitol, what I call “Wattsington DC” and many more predictions Colin and I will share with you about this unique year of turmoil: Predictions for 2011. 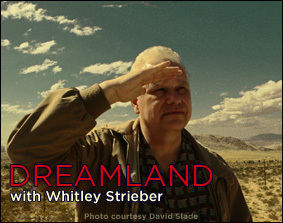 Whitley Strieber and I taped a show on 3 February that I think is one of the finest we’ve done. The subject was: Predictions for 2011. This interview is available free for a week (up to 2/4-2/11) by going to this link: Dreamland. We taped a second interview about prophetic divination and the mysteries of time and thought travel. It was a radical leap from my usual topics. This interview is for Dreamland subscribers only. But it is well worth subscribing for a month to listen to it for the low price of $3.95. Subscribe Here. The number 13 has always been my lucky number! Join us for a three hour interview were we will discuss in detail predictions for the coming year — a year that will define a decade. Read more about what we’ll discuss here: Predictions for 2011. When Jeremiah and I get together we are most politically and spiritually incorrect. Prepare to enjoy a radical take on : Predictions for 2011. It’s our new years show with a new e-book out. See what we’ll be talking about for two hours: Predictions for 2011. We do our traditional “radical” New Year’slook at religion and the future . I will be on Whitely Strieber’s special Christmas program giving some early hints of what I’ll be forecasting for my new eBook Predictions for 2011. If you aren’t already on my free news bulletin list you can join here and be the first to know when the book will be posted at Hogueprophecy.com. We’ll be talking about the midterm elections and the next 2 years of congressional politics plus some early hints of what I’ll be forecasting for my new eBook Predictions for 2011. If you aren’t already on my free news bulletin list you can join here and be the first to know when the book will be posted at Hogueprophecy.com. I did a two hour interview with Patrick Timpone. I talked about a whole number of subjects not usually heard on these shows, including the coming mid-term election and political evolution for the next 1,000 years, as well as my spiritual background. Click here to hear the show Wednesday morning or download the feed in the coming weeks. See the Schedule. Starting on Bastille Day (14 July) in continuous feed is is my interview with William Henry on Whitley Strieber’s UnknownCountry.com’s special Revelations podcast. William and I discusses the unique and powerful astrological alignments that are appearing right now, and I explain how they relate to the upheavals that are taking place all over the world at the present time. Take one last look at what we know before we pass into the unknown. Also we discuss Nostradamus’ Bible of magical practices used to foretell the future. Go to this link to check it out: Shaman Drums. (if you missed it, you can download the audio stream any time you like, click on: Coast to Coast AM). Whitley Strieber taped a powerful show on 28 May. It is now online for a month of free audio streaming starting since 17 June (see Dreamland). Whitley will “put hogue’s feet to the fire” on this show. We examine at the half way point what predictions for 2010 have come true and which have not. 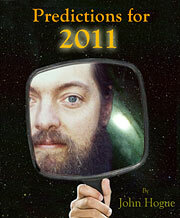 You can put my feet to the fire yourself by reading the eBook (see Predictions for 2010). I’ll be doing a two hour show with Kevin Smith, Monday, 19 April, 7-9 pm pacific. Check out how you can listen to it HERE. 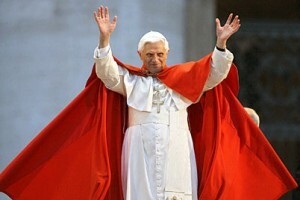 The 19th will be the five-year anniversary of Cardinal Ratzinger becoming Pope Benedict XVI. Kevin and I will talk about the future of the Vatican and this pope. He is next to last in the prophecy of Irish medieval St. Malachy. After him comes the final pope before the apocalypse. Read more about it here: Last Pope. Our main topic will be the continued acceleration of climate and natural disasters (see Predictions for 2010) as well as separating the truth from hooplah about the Mayan prophecies for 2012. It should be a really great show and it will be heard across 143 countries around the world! Catch tomorrow’s April Fool’s show on Patrick Timpone Show: on (ONE RADIO NETWORK) Patrick and I talked at length about Catholic prophecy, the origin of the organized Christian religion and its many conspiracies to change the message and turn Yeshua into a religous-politically expedient myth called “Jesus Christ.” If you missed the fireworks at this heretic roast, you can download a pod cast of the show from Patrick at any time. Read more about my take on Catholic prophecy and scandal, see Pope Benedict XVI. Hola! Mexican and Latin American History Channel fans. Broadcast of new episode and reruns of this series in Spanish continues every week over the next several months. Check your times in your locales. I believe this weekend will show Episodio 11: “La Profecía Perdida de Fátima” across S. America and Mexico. I’m not in it but this is one of my favorite episodes in the series. Sir Isaac Newton, uno de los mayores genios científicos de la historia, fue también un hombre obsesionado con los secretos de la alquimia y las profecías bíblicas. Fue él quien calculó el año 2060 como los últimos días de Tierra. Después del nacimiento de Cristo, el Apóstol Juan recibió una visión de la guerra final de Satanás en contra de Dios. Lo que preocupa a muchos expertos hoy en día es que varios acontecimientos claves que preceden a esta guerra apocalíptica ya se han hecho realidad. El Libro de las Revelaciones describe un final violento para la humanidad – un período de siete años de muerte y destrucción sin precedentes. ¿Cuándo podría ocurrir este Apocalipsis? ¿Y quiénes podrán sobrevivir a la ira de Dios? Una nueva mirada sobre el diseño de las Grandes Pirámides de Egipto, revela en la arquitectura impactantes profecías que auguran un final violento del mundo. ¿Creían los egipcios en que un cometa impactaría la Tierra en el 2012? Muchos creyentes afirman que todos los eventos que anuncian el rapto y la tribulación ya han ocurrido. ¿Cómo es posible? ¿Podría esto significar que el rapto y la tribulación están casi sobre nosotros? Si es así, estamos ahora en el umbral de un Apocalipsis? En 1917, tres niños pastores de un pequeño pueblo de Portugal informaron que habían sido visitados por la Virgen María. ¿Fue el mensaje divino que recibieron los jóvenes pastores una advertencia sobre una aniquilación nuclear? En 1947, unos pergaminos antiguos fueron descubiertos en las cuevas del desierto cerca del Mar Muerto. En uno de los textos, ahora llamado “Rollo de la Guerra”, se expone con un escalofriante detalle una futura guerra apocalíptica que pondrá fin al mundo. It happened on 01/27/10. ABC’s Nightline was in the studio with George listening in to our talk. There will be a special report in the coming weeks. Check Coast for an overview and download of the show if you missed it HERE. 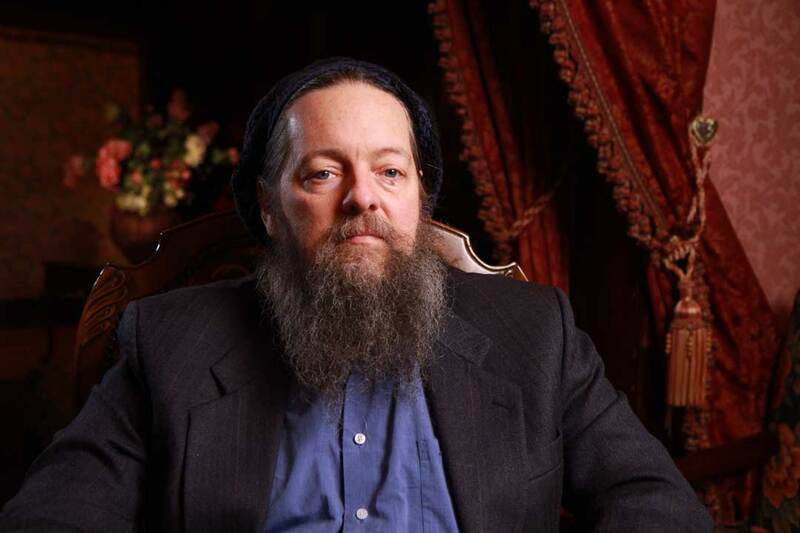 For Whitley’s subscribers, Geoff Stray and Dreamland’s resident prophet John Hogue discuss the relationship between Nostradamus’ prophecies and 2012 predictions. Enjoy this rare discussion between two experts, and listen as they question each other, and in the process uncover some new ideas that neither of them have ever understood before! 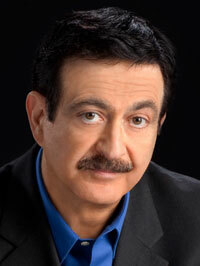 Online (since 02 September 2009) Coast to Coast AM, with George Noory. I know, it is still way out there in the future but I want to give you all advanced warning because when George and me talk it is always an interesting show. I’ll be live online for three hours with George starting at 11 pm Pacific. Mark it in your cell phone, tweet it to you flock, bold face type the time and date on your facebook. We’ll be talking about the final months of 2009, which I expect will be the most dramatic of all. I highly recommend you check out my 20 September interview with Shirley MacClaine at her web site HERE.